A dichotomy at this New Year. As we pack and move and plan and organize, we also see the value in letting go and giving away. Which opens up our lives -- and our hearts -- for the intangible gifts of love, purpose and joy. What a year 2015 has been, and 2016 promises to be another year of change and transition. In fact, we are literally moving into the New Year. Rob sold his office building in Pasadena in November and is moving his office and shop (two rooms full of tools and construction equipment) up to Santa Barbara next week. At the same time, we are moving him out of a guesthouse in Santa Barbara to our place across town. And in mid-January, we will move him out of his apartment in Old Town Pasadena. We have been organizing and packing and planning for several weeks, and I'm grateful we at least got to get away to Mammoth (and a day of glorious skiing) for a few days over Christmas. All of this moving is crazy-making hard work, and to be honest it has tested our young relationship at times. You learn a lot about your partner when under intense pressure. And we've certainly had enough stress the past few weeks to last several years. Thank goodness we also know how to laugh--at the circumstances and ourselves. Rob somehow always knows the exact thing to say to humor me out of a foul mood. And he is a fount of optimism most of the time. But all this moving also makes me mindful of how much change and transition is still ahead of us. 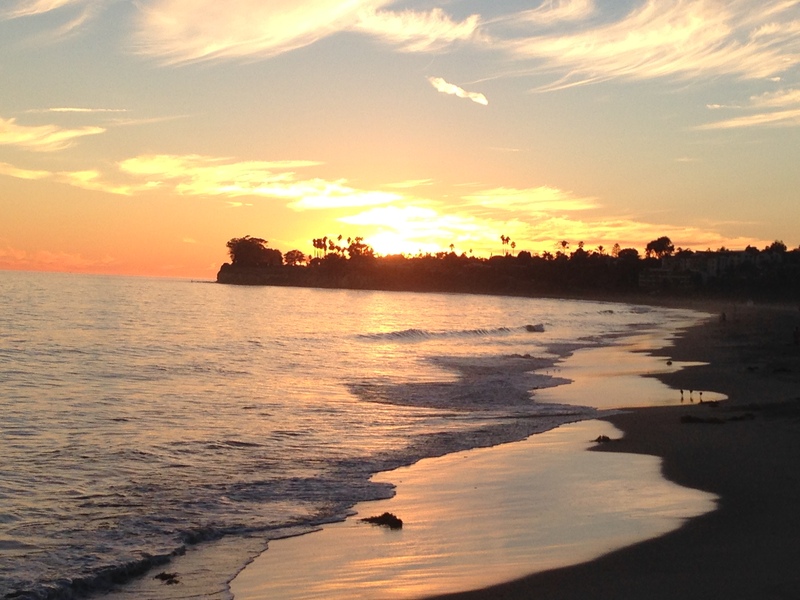 We have been looking for a house to buy, but meanwhile are renting a darling place by the beach in Summerland, a tiny burg just south of Santa Barbara. Tiny is the operative word here; our place is small. It's been fine for the two of us, but when we add all of Rob's things from two different residences we will be overflowing with stuff. My tendency is to get rid of most of it, but Rob is a bit of a packrat (in fact, I think he could fall into major hoarding if allowed). So another negotiation is necessary. For now, most will end up in storage. But that is not a long-term solution. All of this has made me consider just what it means to be settled. I have been in a state of transition since August 2014, when I decided to move to Santa Fe. Most of my belongings went into storage. When I moved back to Santa Barbara a year ago to be with Rob, I remember how good it felt to unpack at least some of my boxes and settle into our new place. For the first time in months I had my own things around me--my furniture and kitchen items, my bedding and clothes, my desk and office supplies. As we unpacked last January, I realized how many things I really didn't need--or want. I have learned I can live without most of the things I thought were important to me. And I have come to understand how little I need to be happy. In fact, having less is a path to a kind of freedom, really, that I didn't know one could feel. It's a letting go that comes with an emotional bonus. Untethered, unfettered, unburdened. So, a dichotomy at this New Year. As we pack and move and plan and organize, we also see the value in letting go and giving away. Which opens up our lives--and our hearts--for the intangible gifts of love, purpose and joy. May you have a 2016 full of the intangible gifts of life. Let all the rest fall away.